When I sat down to write about my experiences as an Asian American actor, I thought it would be a piece of cake. Each day in pursuit of my craft has been equal parts adventure and balancing act as I’ve juggled my film, television and theater career. But though I have been an actor since my teens, I found it difficult to write about a subject so close to my heart. When I first started out in film, each role was a challenge. In 1985 I made my screen debut in a movie called the The Last Dragon. Initially hired to be a karate villain, I reported to the set and was informed I looked too innocent to be in a gang of killers. I got switched over to the good guys—a smaller role, and not as much fun. In 1986, with Big Trouble in Little China, I proved myself sufficiently evil and graduated to the ranks of the bad guys. 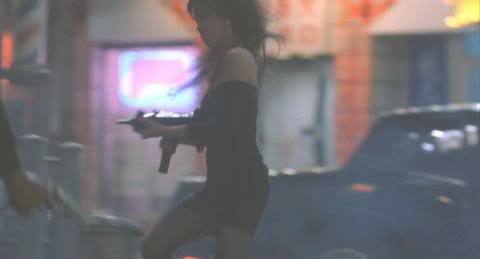 And in King of New York I learned how to shoot an Uzi and died my first on-screen death. Shinko Isobe, James Lew, Lia Chang, Dian Tanaka and Donna Noguchi on the set of Big Trouble in Little China in 1985. Although these first few roles were great technical experience, I was happy when subsequent roles allowed me to play characters who weren’t simply killing or waiting to be killed. In the early 90’s I appeared as a shoe saleslady in A Kiss Before Dying and a hotel desk clerk in Wolf. In The Tax Man the director gave me insights into my receptionist character and let me ad lib as the scene went along. Of these roles, none were written specifically for an Asian actor, and the casting directors approached these projects with a non-traditional casting eye. Finally, opportunities to portray normal human beings instead of the stereotypical characters generally written for Asians–hookers, maids, gangsters and fresh-off-the-boat victims. (Click here to watch clips of Lia in One Life to Live, King of New York and New Jack City). As a sixth generation Chinese American, I lobby for positive balanced portrayals of Asian Americans. And as a professional actor, I seek roles that will allow me to play meaningful and varied characters, whether those characters are specifically Asian or not. After working in these films, I knew I would have more opportunities to act and stay fresh as an artist if I headed for the downtown New York experimental theater scene. 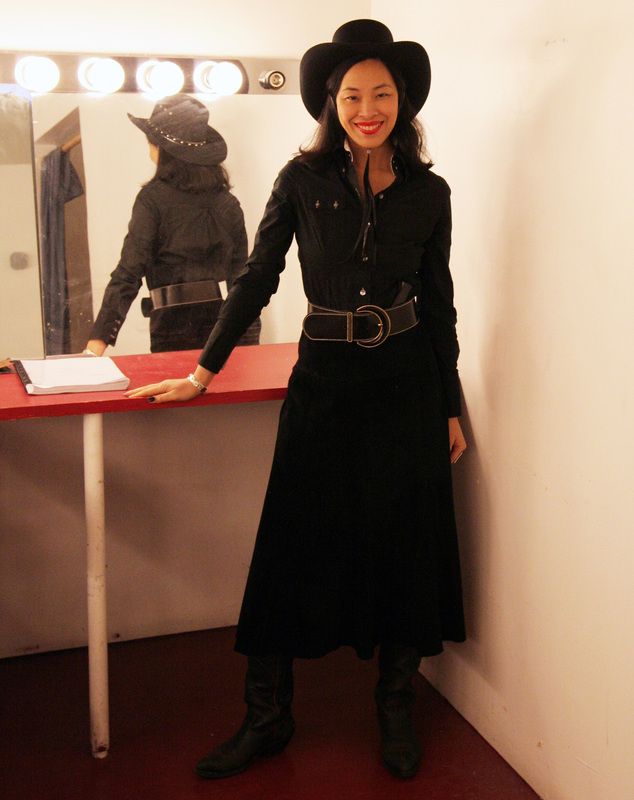 Lia Chang in the dressing room of the Theatre at St. Clement's in New York before the performance of Ed Pomerantz' A Tune Beyond Us on February 15, 2009. In downtown theater I quickly found I was hired for parts because I could embody the character, and not because of my ethnicity. It was welcome change, and it gave me new energy and a chance to acquire new acting skills. In two live theater soap operas–Jeff Weiss’s Obie Award-winning Hot Keys and Cucaracha’s Underground Soap—I honed my comedic timing playing four different characters, including an anchorwoman, an Eastern European spy lady, a teenage pothead nymphomaniac, and a Japanese American woman who plays psuedo-geisha for her Japanese husband. With the writing changing from week to week, I could be funny, sensual, aggressive and racy. Stephen Sable and Lia Chang in Jeff Weiss' Hot Keys at P.S. 122 in New York in 1993. I find that downtown theater, and particularly avant-garde productions, are great for developing artists because there are no rules or boundaries. There is more latitude to be inventive and collaborative—especially when compared to the gun molls and the Asian victims I had played earlier. 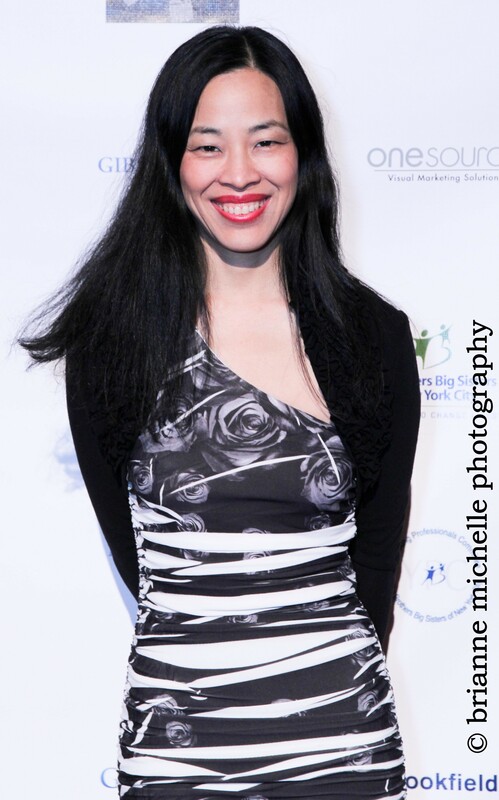 Most of the productions I worked in were non-traditionally cast, but in 1993, I was introduced through New Dramatists and The Women’s Project to plays written by Asian American writers Cherylene Lee and Diana Son. Finally contemporary material I could relate to with characters of substance who faced universal issues. In Diana Son’s RAW (‘Cause I’m a Woman), I played an Asian American woman responding to sexual stereotypes. I also played a Korean American woman who doesn’t understand when her boyfriend tells her in Korean that he loves her. In Cherylene Lee’s Knock Off Balance, my character Dorris Ango is a wealthy Hong Kong businesswoman in search of actors for a movie about arranged marriage. Robert Goulet, Lia Chang and David Carroll at the closing night party for South Pacific in San Antonio, TX in September 1986. 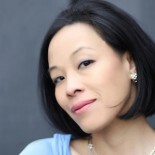 Most recently, reading Amy Tan’s story Half and Half in Symphony Space’s Celebration of The Short Story proved to be a truly rewarding experience. I found I could draw from my own cultural background in presenting the story of Rose Hsu Jordan, a woman whose brother’s death by drowning and mother’s loss of faith impact her own life choices. What I liked about sharing the work of Amy Tan, Cherylene Lee, and Diana Son was the opportunity to access and acknowledge the Chinese part of myself and my family history. Through my research for each role, I gained insight into my own heritage. Lia Chang in the dressing room of the ABC-TV daytime soap opera One Life to Live in New York on June 9, 2010. 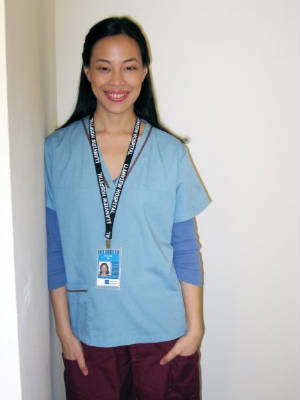 Today, I appear as Nurse Lia on One Life to Live, but I still find that the theater, film and television industries still do not reflect the diversity of our society, and studios rarely envision an Asian American actor for a role unless the script calls for an Asian face. In order for Asian American actors to grow, we need to nurture Asian American writers and directors, and see people of color in positions of influence at the studios. 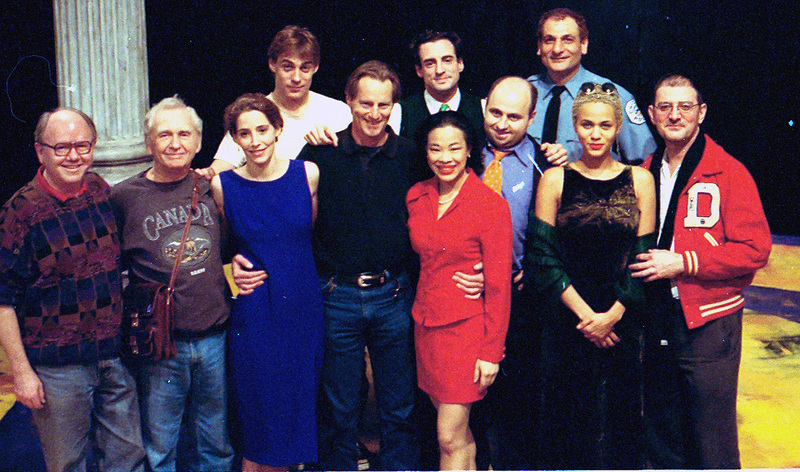 Lia Chang (center) with Sam Shepard and the cast of the Signature Theatre's production of Chicago on the set at The Public Theatre in New York in 1996. Excerpts of this article originally appeared in the spring 1998 issue of Dialogue, a publication of the Asian American Arts Alliance. Photos by Lia Chang at the Shanghai World Expo 2010’s USA Pavilion, Library of Congress and Hollywood Chinese: The Arthur Dong Collection in L.A.
All text, graphics, articles & photographs: © 2000-2010 Lia Chang Multimedia. All rights reserved. All materials contained on this site are protected by United States copyright law and may not be reproduced, distributed, transmitted, displayed, published or broadcast without the prior written permission of Lia Chang. You may not alter or remove any trademark, copyright or other notice from copies of the content. For permission, please contact Lia at liachang@hotmail.com. As a photographer and videographer, Lia is frequently tapped to collaborate with artists, organizations and companies in establishing their documentary photo archive. She has been documenting her colleagues and contemporaries in the arts, fashion and journalism since making her stage debut as Liat in the National Tour of South Pacific, with Robert Goulet and Barbara Eden. Lia’s portraits and performance photos have appeared in Vanity Fair, Gourmet, German Elle, Women’s Wear Daily, The Paris Review, VIBE, TV Guide, Daily Variety, Interior Design, American Theatre, Life & Style, OUT, New York Magazine, InStyle, Timeout.com, Villagevoice.com, Playbill.com, Theatermania.com, The Wall Street Journal, Financial Times, USA Today, The Boston Globe, New York Times and Washington Post. A former syndicated arts and entertainment columnist for KYODO News, Lia is the New York Bureau Chief for AsianConnections.com. She writes about culture, style and Asian American issues for a variety of publications and this Backstage Pass with Lia Chang blog. In July, selections of Lia’s archive of Asian Pacific Americans in the arts, fashion, journalism, politics and space will become part of THE LIA CHANG THEATER PORTFOLIO in the ASIAN PACIFIC AMERICAN PERFORMING ARTS COLLECTION housed in the Library of Congress Asian Division’s Asian American Pacific Islander Collection. What a fascinating career and blog, Lia! You’re a creative dynamo. This entry was posted on July 22, 2010 by Lia Chang in Art, Asian American Artists, Asian American Issues, Chinese American History, Culture, Entertainment, Film, Museum, New York, Theater and tagged A Kiss Before Dying, Amy Tan, Asian American actor, Asian American Arts Alliance, Asian American writers, Big Trouble in Little China, Celebration of The Short Story, Cherylene Lee, Chinese American, Cucaracha, Diana Son, Film, gangsters and fresh-off-the-boat victims, Half and Half, hookers, Hot Keys, Jeff Weiss, karate villain, King of New York, Knock Off Balance, Korean American, Lia Chang, maids, New Dramatists, Nurse Lia, One Life to Live, RAW ('Cause I'm a Woman, Rose Hsu Jordan, Symphony Space, television, The Last Dragon, The Tax Man, The Women's Project, Theater, Underground Soap, Wolf.